As something of a natural progression we have found over the years that the skills that are valued so highly within the exhibition industry are transferable and equally in demand in the retail and commercial interiors sector, and as such we are proud to have completed some remarkable such projects with great success, including a travel goods shop that we were asked to conjure in to the interior of an aeroplane, complete with hostess trolleys as display cabinets and overhead baggage compartments for storage and aeroplane windows and doors!. 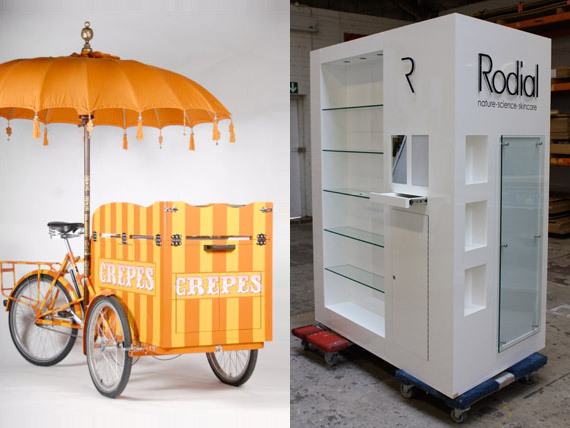 We are as accomplished and experienced in building retail booths or kiosks from scratch as we are retail units in their entirety. We are fortunate to have worked with excellent results in virtually every major shopping centre in the UK including, Westfiled Stratford, Westfield Shepherds Bush, The Bullring, The Trafford Centre, The Centre:MK, The Oracle, not to mention all the major UK airports. The versatility of our workforce extends not just to our workshop but also to our design department who excel at creating eye catching and innovative yet practical design schemes. 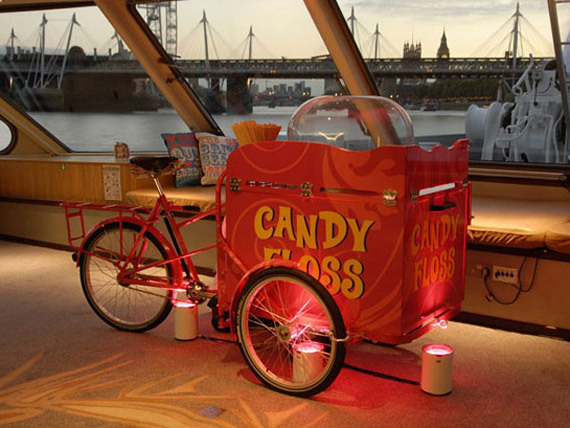 We are equally adept at creating amazing spaces be they, receptions, offices, bars, shops, spas, show flats or marketing suites. Island Exhibitions design and build for retail and service companies retail booths/ kiosks for installation in malls and airports etc. 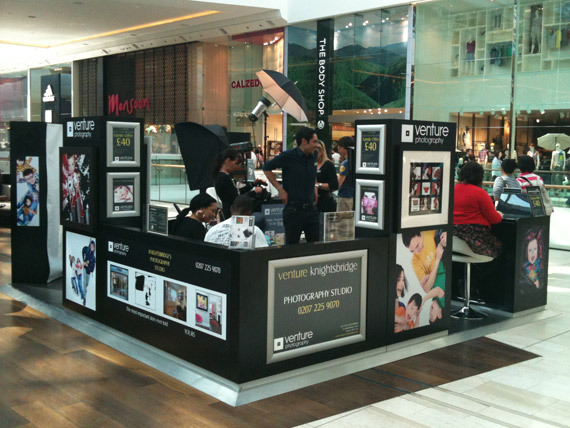 We work with small business who only require one, to large chains with a presence in shopping centres all over the UK. 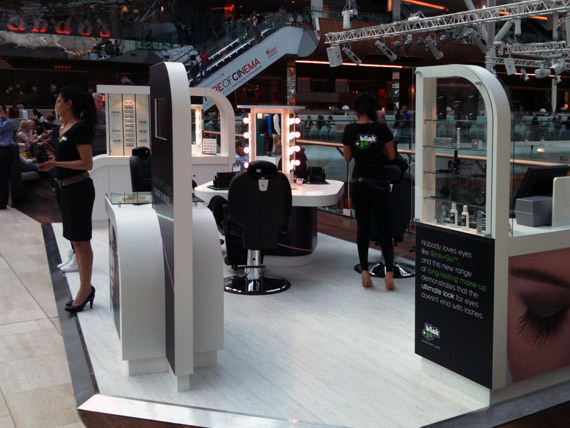 We have worked in virtually every major mall in the UK, and have developed an insight in to the practicalities of design and build with units of this type that has proved invaluable to the long term benefit and profitability for our clients. Some installations are permenant, others we install for a set period, then remove and store, before reinstalling. We aim to be as flexible and accommodating as possible to meet the requirements of the clients and the centres themselves. We offer full service product promotion from platform design, build, delivery and installation through to removal or transfer to a different location. 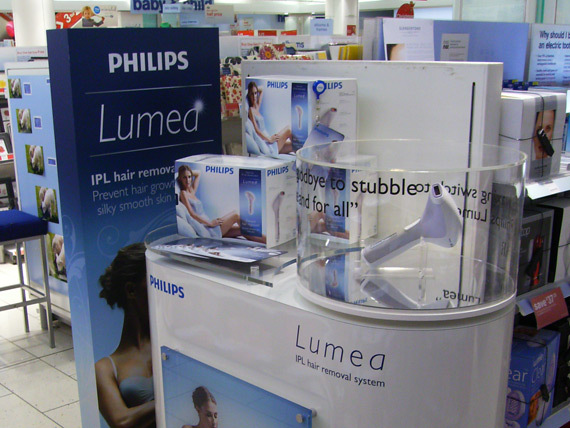 This could be in the form of a road show style trailer to small product plinths such as the one shown above for Phillips Lumea, 50 of which appeared in Boots all across the country.